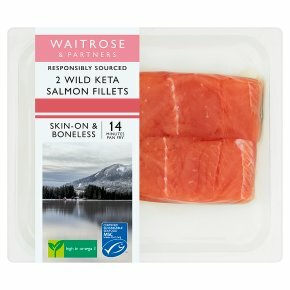 Wild caught Alaskan Keta Salmon, caught in the North east Pacific. Great for a nutritious meal in minutes. Size and thickness of fish may vary, cook times are given as guidance. Pan Fry. Time: 13-14 mins. Remove all packaging. Heat 1 tablespoon of vegetable oil in a frying pan. Place salmon into the pan skin side down and pan fry over a medium heat, turning halfway through cooking.